Not everyone in Search Engines Optimization knows about the fact ratio of the incoming links and Google PageRank. All we have is “specialists’ opinions”, which may be right or totally wrong. This article will help you to understand and find out what is going on there for real. Understanding of the technical part of backlinks and Google PageRank is very important for the SEO when they have to answer the common questions asked by the SEO clients who don’t even imagine how it works. It will also help to understand how they can improve the existing SEO strategy. It was many times proved that Google PageRank is similized to the link popularity and the high popularity means the value but not always means the relevance. That’s why we can see the sites with low PageRank on the top of search results. This article is not about how to raise PageRank to improve the ranking. It won’t happen anyway. If you are trying to improve your rating in search engines pay attention to things that are more important than PageRank (content, effective attendance coefficient (convert), actual community links etc.). But this article is devoted to the deep studying of the dependence of backlinks and Google PageRank. As we know Google PageRank was changed a lot for the last years and the information we obtain may be outdated. We can achieve our goal by carrying out a scientific research. It means gathering information, analyze it and then make conclusions and recommendations. “One test is worth thousands of experts’ opinions”. In the current research we are going to use the Google Toolbar values, showing the pages’ PageRank (from 1 to 10) as the real PageRank according to Google cannot be shown to the public. 1. What is the dependence between the incoming links and Google PageRank? How great is it? 2. How does Google interpret the incoming links into the PageRank value shown on the toolbar? 3. How difficult is it to raise PageRank? For instance how many links is needed to raise PageRank from 1 to 2? Is it enough to raise PageRank from 9 to 10? 4. How can we use this research to improve the quality of backlinks of a web-site? If you are interested in this research and you want to find out more, read the text below. According to the classic definition of PageRank, the PageRank of a page is a function of all the backlinks towards itself. These backlinks come both from the domain and from outside. 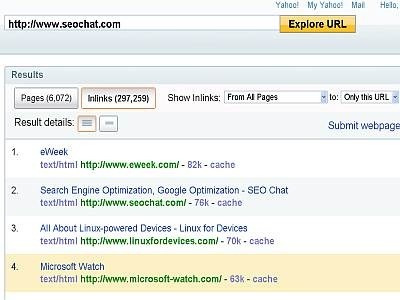 You can see that there are 297259 backlinks to the Front Page of seochat.com, that come from ALL pages (inside the domain and outside). 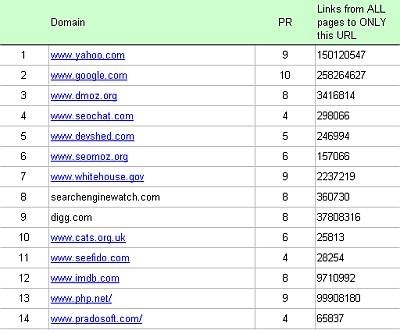 These backlinks respond for the PageRank value of this page. To give this research some precision and accuracy, the summation of the backlinks and the data about Google PageRank will be collected for 100 random web-sites. Then we’ll put this data into an Excel table. The Google PageRank values will be taken from the Toolbar. Answer: There is a direct/strong logarithmic dependence between Google PageRank and the common sum of the incoming links to the URL. R to the square (determination coefficient in statistics) is 67%. It means that 67% of PageRank depends on backlinks today. How does Google interpret the incoming links into the PageRank value shown on the toolbar? where: Y is the common sum of the incoming links to the URL, X is the PageRank value. 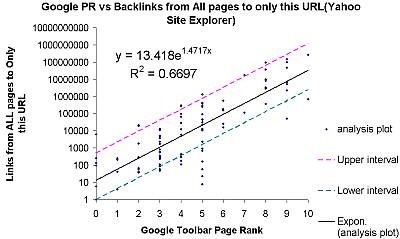 In practice we’ll try to show the PageRank value as a function of incoming links. So let’s find the X value. e is a constant value in the natural logarithm. It is 2.71828… Get this equation into an Excel table and it will count an approximate PageRank value given by the common sum of incoming links (y is a variable). where b is the precise algorithm base, displaying the difficulty of every PageRank value. X is the PageRank value; Y is the common sum of links. At this table we clearly see that starting with one backlink with the PageRank 0 we need four links to raise PageRank to 1. But to get PageRank to 2 from 1 we must have 22 of them. 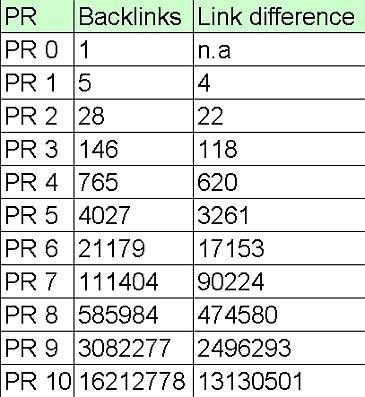 This difficulty rises with every PageRank level; it’s much easier to get PageRank from 3 to 4 (the difference is 620 links) than from 9 to 10 (the difference is 13 130 501 links). The reason is that PageRank has a logarithmic dependence. It also explains such a small number of sites with PageRank level 10 in the Internet and the great number of sites with PageRank from 1 to 3. How can we use this research to improve the quality of the backlinks of a web-site? This research tells us a lot about the PageRank algorithm. First of all as 67% of PageRank depends on the backlinks it makes sense that all the SEO strategies pay much attention and spend resources to improve the quality and the quantity of the backlinks to the site. Some ethic methods may improve the backlinks. Such methods as link attraction and link-magnet content creation are the best ways to improve the quality of your site. You need much more than just PageRank to get the traffic and clients from search engines. Ensure that besides your link and PageRank rising your traffic and the effective attendance coefficient of your web-site (convert) also improves. This is where many sites fail. ← How does PageRank work?